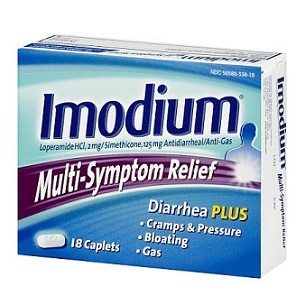 Some people are using the anti-diarrhea drug loperamide (Imodium) to manage their opioid addiction or to get high, researchers report in this week’s Annals of Emergency Medicine. The results can be deadly, according to NPR. The researchers from the Upstate New York Poison Center report on two people who were addicted to opioids, who died after taking much more than the recommended dose of loperamide in an attempt to ease their withdrawal symptoms. “Because of its low cost, ease of accessibility and legal status, it’s a drug that is very, very ripe for abuse,” said lead author William Eggleston. Loperamide can be bought without a prescription. It comes in liquid or pill form. It activates some of the same brain receptors as opioids. At the recommended dose to treat diarrhea, loperamide does not produce euphoric feelings. Eggleston noted that at doses that are 10 or more times higher than the recommended amount, loperamide can help ease symptoms of opioid withdrawal. Very high doses can produce a high that is similar to opioid pills or heroin. These high doses can disrupt the heart’s rhythm, which can be fatal. Eggleston said the Upstate New York Poison Center has had a sevenfold increase in calls related to loperamide use and misuse over the last four years. Eggleston and his coauthors advocate restricting sales of loperamide. They say the medication should be dispensed by pharmacies, and sold in limited doses. Why do you thibk this population of Rx opioid dependant patients are seeking relief via loperamide. in concert with government regulation there should have been medications (in addition to buprenorphine and methadone) that a physican,in his or her judgement could legally Rx their addicted patients;much like in Europe. what we did was restrict access to pharmaceutical opioidsand traded that for the largest heroin epidemic this country has seen. As a proponent of harm reduction we have a FAILED!